Unwrella is now available in version 3.10 for Autodesk 3ds Max and Autodesk Maya. The Unwrella 3.10 update represents the next step in refining one of the best automatic unwrapping tools. This minor update comes with speed, stability and performance boosts. 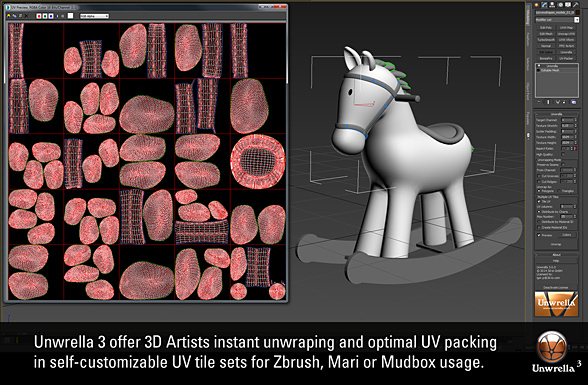 Unwrella 3 offers 3D artists instant unwrapping and optimal UV packing in self-customizable UV tile sets. 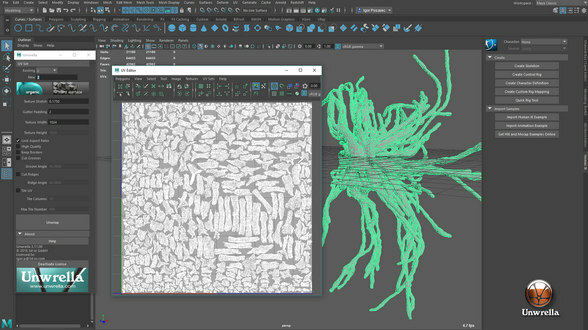 Artists now can easily control the number of UV tiles, automatically generate material IDs for each UV tile or unwrap the UV tiles according to material ID settings. Fixed a problem that made it impossible to unwrap an object with one or more very large UV charts when using tile distribution mode. Fixed an issue where unwrapping in tile distribution mode sometimes didn’t work with certain mesh topologies. 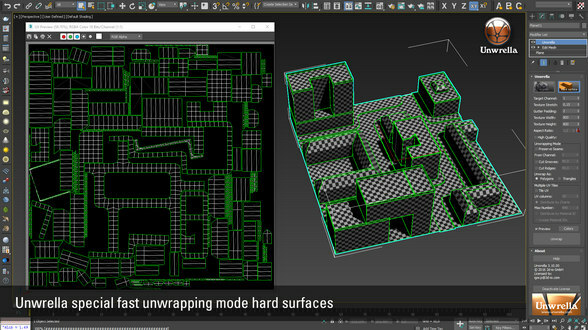 Performance increases: Faster UV data initialization, improved performance for tile mode distribution, prevented slowdowns when objects share a plug-in instance. All our products use a mobile license, which you can move from one computer to the other around the world (web connection needed, or usb stick). The activation & deactivation follows with a simple click. For more, detailed explanations about the licensing functionality, please click on the image left or Unwrella Licensing. 3d-io games & video production GmbH is specialised company for high-end software development, modeling, animation, rendering, CG effects and 3D industrial design. 3d-io GmbH, headquartered in Wiesbaden, Germany, has an established strong presence in game development, design & video production, digital content creation as well as in graphics and animation. We are dedicated to provide easy-to-use software products accompanied by dedicated support team, experienced programmers and top notch 3D artists. Our latest product on the gaming market was nominated for the German Game Developers Award 2008 in best graphics category, and CG products are used by many famous Game and Design Studios worldwide.